2017 In A Sentence: In a relativity down SEC East, Vanderbilt finished just 5-7 overall without a bowl bid and with a 1-7 conference slate–the fifth losing season in a row for Coach Mason (who did lead Vandy to one bowl game loss in 2016). Biggest Shoes to Fill: RB Ralph Webb departs the Commodores as the holder of virtually every career rushing mark, including 4,173 rushing yards, 931 carries, 32 rushing touchdowns, 35 total touchdowns and 16 games of at least 100 rushing yards. He was an undrafted college free agent pickup by the NFL’s New England Patriots. Key Player: QB Kyle Shurmur is back for his senior campaign and hopes to continue his pace from last year. He set a school record with 26 touchdowns but only completed 58 percent of his passes and he will have to lead new receivers after the top two pass-catchers are gone. Fearless Prediction: The schedule is about as easy as can be asked for in within the SEC. 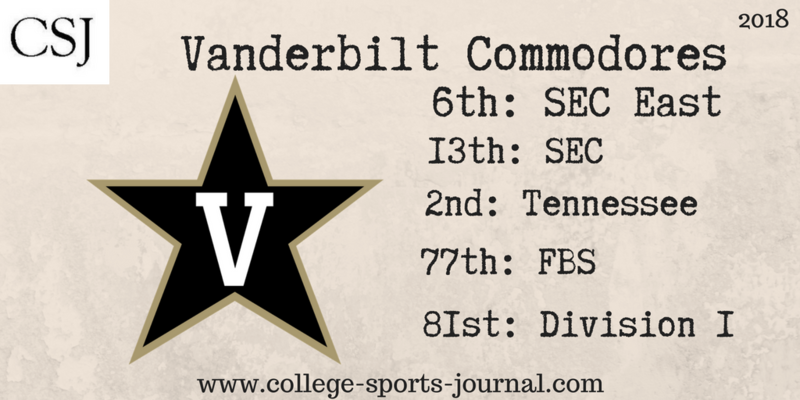 Vanderbilt gets no Alabama, no LSU, and no Auburn. The key for this team to get to a bowl will be to win at least three of the four out-of-conference games to get to a bowl game. Expect that to happen and the Commodores to get to the six win mark.